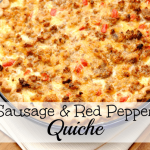 Sausage and Red Pepper Quiche Recipe – A delicious quiche recipe that is perfect for breakfast, brunch, and dinner. A family favorite that everyone will love! Bake shell in for 7 min or until it just golden. While shell is baking, remove sausage from casings and cook in large skillet. Dice red pepper and add to skillet. Break up sausage and stir until sausage is no longer pink. Drain mixture, discarding excess fat. Mix sausage and cheese in a bowl. Add salt and pepper to taste. Spread the mixture in the bottom of the pie shell. Whisk together eggs, half and half and milk in bowl. Pour egg mixture over sausage mixture and bake on baking sheet for 20 minutes. Reduce oven temperature to 350 and bake for an additional 10-15 minutes until center of quiche is no longer runny.